The fall term is underway and our chapters across the country (and one in Canada!) are engaged in many activities that advance the Rho Chi Society and its mission. Professional evolution, scientific advancement, and changes in academic structures and processes necessitate deliberate consideration of the Society's mission, vision, and goals in context of contemporary academic and scientific environments. Along this line, the Executive Council initiated a strategic planning process in March 2018. We anticipate completing a revised strategic plan in the fall and will present it to the membership at the 2019 March Annual Meeting in Seattle. We look forward to receiving additional feedback on this important endeavor in the coming months. On behalf of the Executive Council and the National Office, I wish you a successful academic year, and please remember that we all stand ready to assist you as needed. The Rho Chi National Office has moved to the University of Southern California School of Pharmacy where Rho Chi Society Executive Vice President Michael Wincor is Associate Dean for Global Initiatives and Associate Professor of Clinical Pharmacy, Psychiatry and the Behavioral Sciences at the Schools of Pharmacy and Medicine. The office is ready to serve you. Do not hesitate to contact the national office at rhochi@usc.edu or 323-442-1383. The Rho Chi National Bylaws were reviewed and updated by a committee headed by Dr. Lucio Volino, Alpha Eta Chapter Advisor and Regional Councilor (Region II). The revised National Bylaws were approved by an affirmative vote of the chapter delegates at the 2018 Annual Meeting in Nashville. This document provides a wealth of information on the membership requirements, as well as officer, regional councilor, chapter advisor, and committee responsibilities. Should a situation present itself that you are not quite sure how to handle, please consult the National Bylaws. In addition to the bylaws, the Bylaws Committee created an Annotated Supplemental Guide to the National Bylaws. This new resource is intended to be used in conjunction with the newly revised National Bylaws to guide the Chapters’ activities and the members’ understanding of the Rho Chi Society. A newly completed Advisor’s Guidebook serves in tandem with the National Bylaws as a reference to faculty advisors for the Rho Chi Society. The Society would like to thank Co-Chairs Dr. Dana Brown and Dr. Cynthia Phillips and their committee for creating this new resource. The Society’s 2019 Annual Meeting will be held in conjunction with APhA’s Annual Meeting and Exposition in Seattle, Washington, March 22-25, 2019. Delegates and alternate delegates from each chapter should be present at the Annual Meeting which is tentatively scheduled for the afternoon of Sunday, March 24 (pending final confirmation by APhA). The recipients of the Society’s awards will be recognized, and the 2019 Rho Chi Society Lecture will be presented. As details are finalized, updates will be sent via email to Chapter Advisors and Chapter Presidents and posted to the Society’s website . Chapters are encouraged to participate in the Society’s Chapter Awards Program. Not only can chapters gain financial support for their efforts, but also participation by all chapter members can be a unifying and exciting accomplishment for the Chapters. The Chapter Awards Program is divided into two award categories, 1) Chapter Achievement Awards (Most Outstanding Chapter and Most Improved Chapter) and 2) Chapter Project Proposal Awards. One or more chapters are identified annually for overall excellence in fulfilling the mission of Rho Chi. The Chapter Achievement Award winners are determined through a review of annual reports submitted to the National Office by May 15. Reports that will be evaluated for the 2018 award have already been received, but it is not too early to define your plan for the 2019 award and to begin keeping a record of your accomplishments. 2016-2017 Chapter Achievement Award (Most Outstanding Chapter) Recipient - Alpha Theta Chapter at the University of Colorado . They created a wonderful video that showcases the chapter’s activities. The following Regional Finalists for the Chapter Achievement Award were also recognized for their outstanding commitment to the Rho Chi Society’s mission. 2016-2017 Chapter Achievement Award (Most Improved Chapter) Recipient - Alpha Psi Chapter, University of Arizona. By virtue of Alpha Theta and Alpha Psi Chapter’s achievements, each will have a student representative on the Rho Chi Society’s Executive Council for one year as of March 2018. Alpha Xi Chapter, University of Kentucky, “Closing the Gaps” – Distributing Naloxone and Improving Education on Opioid Overdose, Focusing on Underserved Minorities and Improving Education Efficacy. Gamma Sigma Chapter, Western University of Health Sciences, The Art of Prescribing Hormonal Contraception. Gamma Sigma Chapter, Western University of Health Sciences, Traveling Prepared – Implementation of Travel Medications and Vaccinations. Beth Resman-Targoff, Pharm.D., FCCP, the Gamma Chapter Advisor at the University of Oklahoma, was the recipient of the 2018 Faculty Advisor Award. Deadline for submission of nominations is February 1, 2019. Past recipients and further details can be found on the Rho Chi website. Five outstanding alumni were named to the 2018 Alumni Honor Roll in recognition of their outstanding contributions through intellectual leadership and the pursuit of excellence that have advanced the profession of pharmacy. Annually each Chapter may identify one alumnus for the Alumni Honor Roll. The National Office would like to receive annual nominees from all chapters. Nominations are due February 1, 2019. Further information and nomination procedures can be found here. The recipient of the A. Wayne Pittman Outstanding Service Award will be a member of the Rho Chi Society (regular or honorary) who has made outstanding, significant, and sustained contributions to the Society and whose efforts have profoundly advanced the vision and mission of the Society. Detailed criteria and the selection process. Honorary membership is among the highest distinctions bestowed by the Society to persons with distinguished scholarship or service to pharmacy. Honorary members may be nominated by any chapter or by a member of the Rho Chi Executive Council. 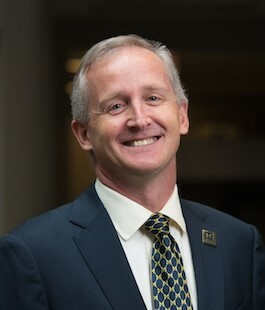 In 2018, Dr. Michael Moné was inducted as an honorary member. He has distinguished himself in the regulatory side of the profession, serving as the Executive Director of the Kentucky Board of Pharmacy prior to assuming his current position as VP Associate General Counsel for Regulatory Affairs for Cardinal Health. In addition to serving as President, Vice President and Treasurer for ACPE, he has served as the APhA Speaker of the House and member of the APhA Board of Trustees. 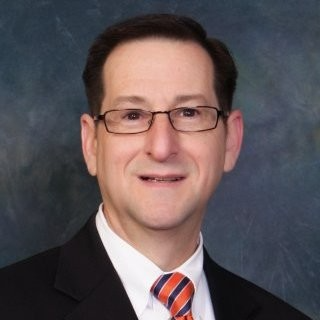 He has also served in several elected offices on the Florida Pharmacy Association and the Ohio Board of Pharmacy, and provided critical leadership on law and governance-related issues to the National Association of Boards of Pharmacy and the U. S. Pharmacopoeia, Inc. The Rho Chi Society offers funding opportunities for graduate students and clinical research fellows. Deadline for the 2019 Clinical Research Scholarship is December 15, 2018. 2018 Recipient: Christopher Saffore, Phi Chapter, University of Illinois at Chicago College of Pharmacy, Department of Pharmacy Systems, Outcomes and Policy, is the recipient of the 2018 Rho Chi, Clinical Research Scholarship. This Fellowship is for a full-time pharmacy student in the final year of professional studies or a professional pharmacy degree program graduate entering a pharmaceutical sciences (including social/administrative sciences) Ph.D. program in an accredited U.S. school or college of pharmacy. Pharmacy students who have initiated graduate work through a dual Pharm.D. /Ph.D. degree pathway are eligible if they have completed their professional degree and will be pursuing full-time graduate study in the year the award is made. Deadline for the First-Year Graduate Fellowship is May 1, 2019. If you are planning to enter a graduate program in 2019-2020 or will begin the second year of a clinical research fellowship, please check the website for application information and criteria for these two funding opportunities. During the spring of 2018, two Chapters initiated their Charter members and became the most recent Rho Chi Chapters. The Society is pleased to welcome Epsilon Xi Chapter at Marshall University School of Pharmacy, Huntington, West Virginia and Epsilon Omicron Chapter at Fairleigh Dickinson University School of Pharmacy and Health Sciences, Florham Park, New Jersey. 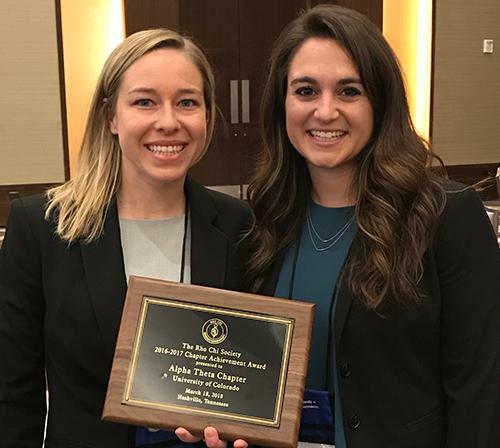 More than 200 students, faculty advisors, officers of the Society, and guests attended the Annual Meeting and Award Program in Nashville, Tennessee on March 18, 2018. Delegates representing 106 chapters were present. Attendees of the Annual Meeting were privileged to hear Dr. James T. Dalton, recipient of the 2018 Rho Chi Lecture Award, present his lecture entitled “Building a Crooked Stairway in Pharmacy.” Dr. Dalton is Dean and Professor at the University of Michigan. He received his Bachelor of Science in Pharmacy from the University of Cincinnati and the Doctor of Philosophy degree in pharmaceutics and pharmaceutical chemistry from The Ohio State University. Dean Dalton rose through the faculty ranks in the Department of Pharmaceutical Sciences in the College of Pharmacy at the University of Tennessee before returning to Ohio State, where he served as Professor and Chair in the Division of Pharmaceutics. An entrepreneurial leave of absence from Ohio State was the stepping stone to a position as Chief Scientific Officer at GTx, Inc. in Memphis, where he oversaw the preclinical and clinical development of selective androgen receptor modulators (a new class of drugs discovered in his labs). Dr. Dalton is a Fellow of the American Association for the Advancement of Science (AAAS) and the American Association of Pharmaceutical Scientists (AAPS). He has co-authored over 170 original peer-reviewed scientific manuscripts and is an inventor on over 300 U.S. and international patent applications. The Rho Chi delegates unanimously approved the charter petition for the University of North Texas System College of Pharmacy. It will become the 129th chapter inducted into the Rho Chi Society. Installation of the Epsilon Pi Chapter and its charter members will take place in early 2019. Delegates elected Emmanuelle Schwartzman, Pharm.D., APh, BCACP, CDE; Associate Professor of Pharmacy Practice and Administration; Director, Residency and Fellowship Training, Western University of Health Sciences, College of Pharmacy as National President-Elect. She will serve two years as National President-Elect before becoming the Rho Chi President in 2020. 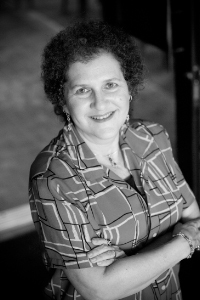 Dr. Schwartzman has also served as a Rho Chi Society Regional Councilor and is the current Chapter Advisor for the Gamma Sigma Chapter. The Society would like to express gratitude to Dr. Lucio Volino, Rutgers University, Region II Councilor and Dr. Karen Farris, University of Michigan, Region IV-East Councilor who completed their terms of office. Their guidance to their respective regions and dedication to the Society is invaluable, and the Society looks forward to their future contributions. If you do not know your chapter’s Regional Councilor, visit the Society’s website rhochi.org and choose Directories/Councilors. 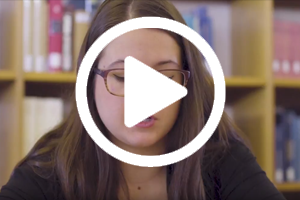 Alpha Eta Chapter at Rutgers University created a video to ignite the passion for the Rho Chi Society in its newly inducted members. 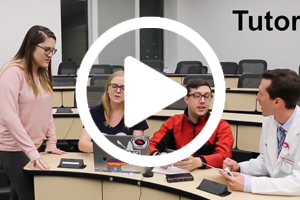 The Alpha Eta Chapter has graciously released the video for use by all Rho Chi chapters. Please encourage your new and current Rho Chi members to view it. Information for new initiates (for membership, jewelry, certificates) should be submitted at least three weeks prior to an induction ceremony via the Rho Chi website’s Members link. Advisors who have not utilized this function, please contact the National Office at rhochi@usc.edu for instructions for access. Fees for newly elected members in 2018-2019 will remain at $65.00 per new member. This one-time membership fee includes Society dues, membership certificate, and jewelry. Names and contact information for your chapter officers for 2018-2019 are needed in the National Office. All chapter presidents will receive information and announcements from the National Office. If your Chapter has not submitted contact information for your current officers, please submit this information as soon as possible using the on-line form.